Located across from FIU’s world of academia is Jasmine Thai Sushi, a little spot run by Chef Chai, who could teach his own class on preparing fresh, quality sushi. Even the menu – a thick, homemade notebook featuring seven pages of sushi – looks like a book report. Jasmine is tucked away in a back corner of a big strip mall crowded with a Publix supermarket, DMV office, pool hall, banquet hall, a gym, and many offices. But inside, the atmosphere is soothing and intimate, the food delicious, and best of all, the exceptional service will make you feel at home. Chef Chai, originally from Thailand, came on board just three months ago, but he’s already making his mark. He handles everything, from picking out the delicate lamps hanging over the sushi bar to selecting the right mix of alternative music and shopping for fresh ingredients every day. He even does some dishwashing. Many of the sushi items on the menu are his creations, such as the Dynamite Lovers Deluxe and Double Lovers Deluxe rolls ($8.95 – $17.95), which are double-stacked with seafood inside and out. 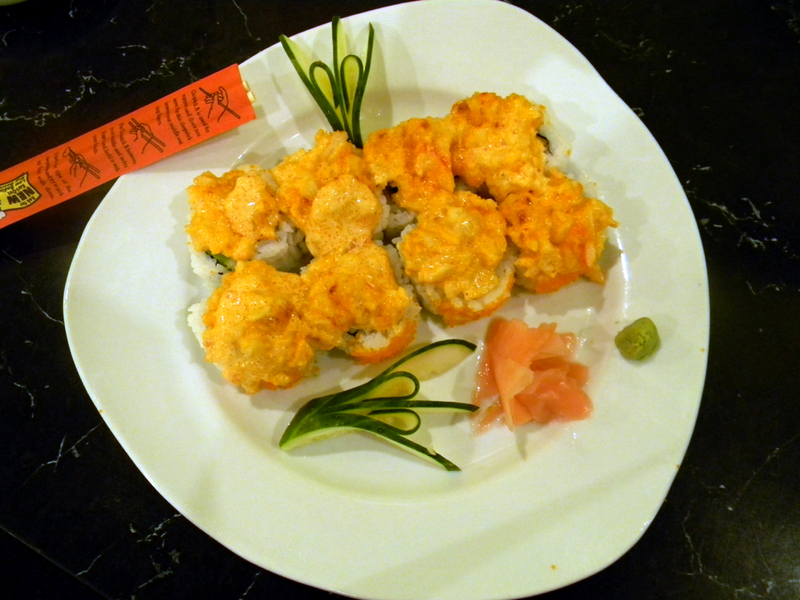 Among the most popular choices is the Volcano Roll ($13.95), a serving of California Rolls topped with chunky seafood in a spicy mayo/mustard sauce. Some places just spray the top of the rolls with the mixture, but Jasmine really piles it on. 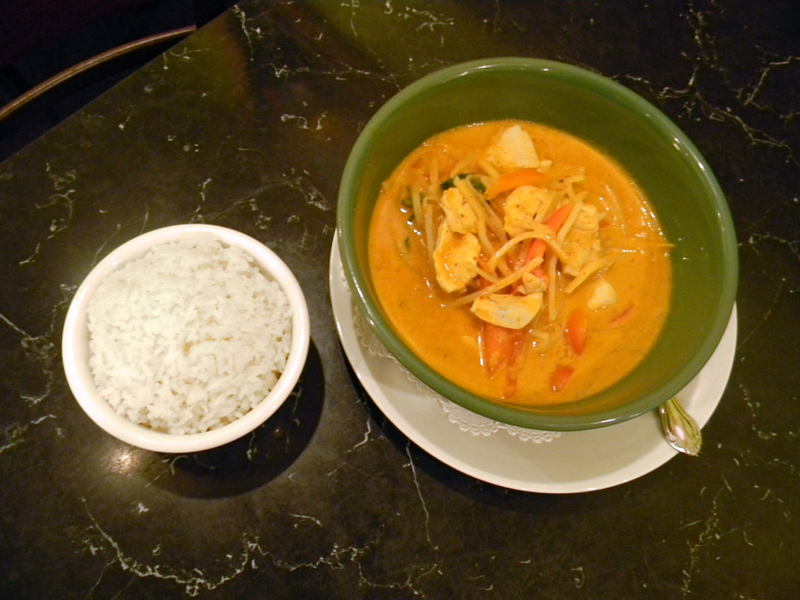 From the Thai menu, try the Red Curry Chicken ($13.95) with veggies and bamboo shoots simmered in coconut milk and spices. It comes with jasmine rice. 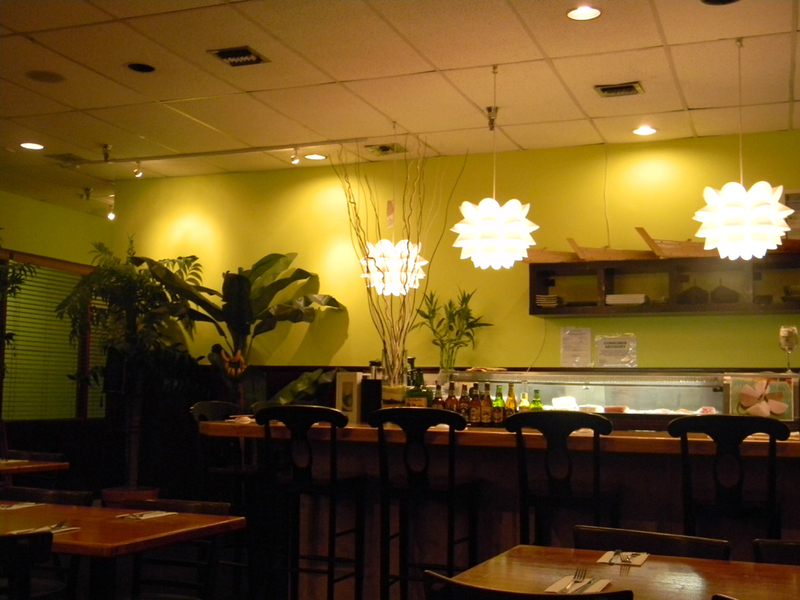 Other items include soups/salads ($2.95 – $8.95); Thai noodles and fried rice ($11.95 – $13.95); curries and other main dishes ($11.95 – $14.95). 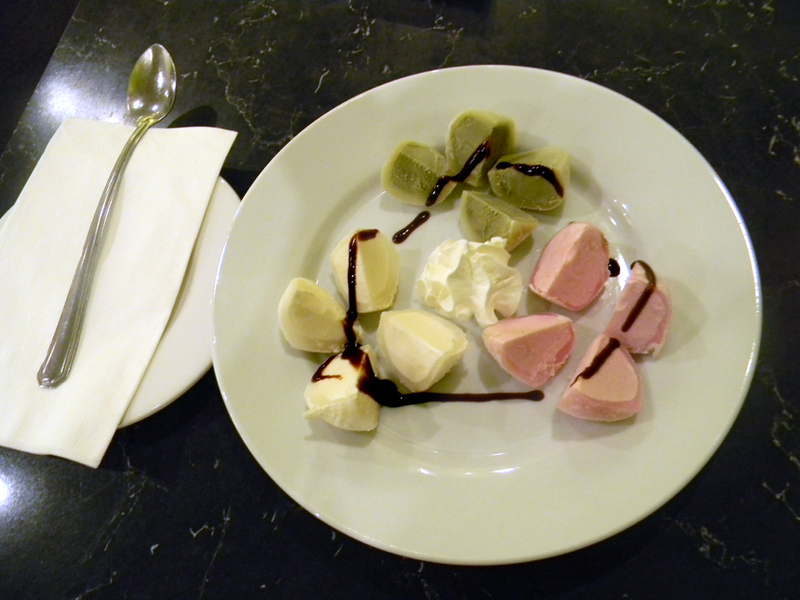 Jasmine also offers a traditional Japanese treat – Mochi ice cream. The outside layer is made from gluttonous rice, which tastes nothing like rice and melts in your mouth, and the center is filled with creamy vanilla, strawberry, red bean, or green tea ice cream. Yummy! Lunch specials are available Monday – Friday, from 11:30 a.m. to 2:30 p.m.
Dinner: Monday – Friday, 5 to 11 p.m.
Saturday, 12:30 to 10:30 p.m.
Sunday, 12:30 to 10 p.m. 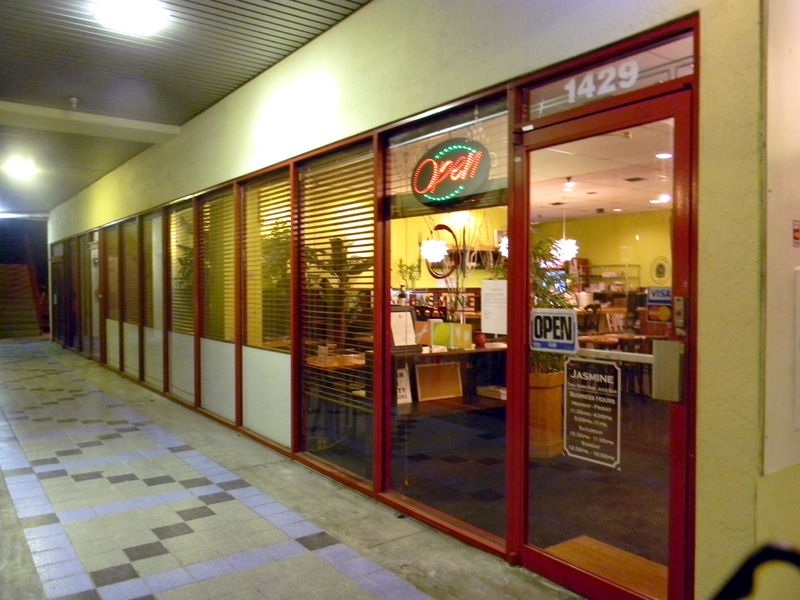 I live near by FIU, I really enjoy the food here special Dragon Roll and Volcano Roll. The food is great, I always go there with my family. We really love it. Chef Chai always come and take care his customers to make sure that everything is ok. Mostly I recommend my friends come to here and enjoy food and music. This place is hidden gem in Miami. I think the restaurant open Monday to friday whole day from 11:30 AM to 11:00 PM But the lunch finish at 2:30 PM. If you come after 2:30 PM, it will be dinner time. Thanks for your comment, Emma. I really appreciated for your support and very happy to serve you again. Next month, I will have new Sushi Roll coming out, please come and enjoy my food and music. Thanks for your comment! Check back regularly for more great restaurant picks. ңello, Ι enjoy reding all of your post. Ӏ like to write a litle comment to support you.